Before anybody cries foul about how the Minnesota Vikings, Miami Dolphins and the New York Jets were left out of the winners section of this story, read my column from Thursday night. All of those teams had great opening nights of the draft and deserve plenty of praise. The Jets even deserve a little more for the value of getting quarterback Geno Smith in the second round, but there's a big question about whether Smith is going to be able to handle the fish bowl effect of New York. St. Louis Rams QB Sam Bradford – The story goes that St. Louis coach Jeff Fisher had to tell Bradford and the other Rams quarterbacks to stop smiling when they went to West Virginia to work out Tavon Austin. Well, Bradford is beaming after the Rams actually got Austin to go with a receiving corps that also includes Brian Quick, Jared Cook, Chris Givens and Lance Kendricks. These are the weapons Bradford has been craving the whole time he has been in the league. Now he has no excuses for not putting up numbers expected of a former No. 1 overall pick. San Francisco 49ers – Sam Bradford's NFC West rivals in San Francisco and Seattle obviously amped the competition this offseason with their many acquisitions. The 49ers were particularly impressive this weekend as they filled in every major need they had with a safety (Eric Reid) to takeover for departed Dashon Goldson, a defensive lineman (Tank Carradine) to eventually replace Justin Smith, a tight end (Vance McDonald) to replace Delanie Walker and a potential star at running back (Marcus Lattimore) to eventually replace Frank Gore, assuming Lattimore returns to health. The only problem for the 49ers is that they drafted more players (11) than they can possibly keep. Baltimore Ravens – The Super Bowl champions have taken their lumps this offseason with the loss of several players, including Ed Reed to free agency and Ray Lewis to retirement. Things were so bad that some Ravens fans almost seemed to forget their team just won the title. This draft should assuage some fears as the team found the respective replacements for Reed and Lewis in Florida safety Matt Elam and Kansas State linebacker Arthur Brown. Look, no one is saying Elam and Brown are going to be future Hall of Famers, but both look like sound bets to be very good. New York Jets coach Rex Ryan – Yes, Ryan was among the winners from Thursday night when the Jets took cornerback Dee Milliner and defensive tackle Sheldon Richardson, but things only got better. Drafting Geno Smith is a boon to Ryan regardless of whether Smith can play. Assuming the Jets do the smart thing and dump Mark Sanchez, Smith automatically becomes the starter and Ryan gets a chance to make this a full-fledged turn toward the future rather than some weird balancing act with Ryan perched on Sanchez's shoulders (or tattooed on Ryan's shoulder, as it truly is). If Ryan can rebuild the defense quickly and get the offense to stay error-free, an 8-8 season might make it hard for the Jets to fire him. Yeah, Ryan still looks like a dead man walking, but there's a hint of a lifeline. Chicago Bears – General manager Phil Emery continued his pragmatic approach to getting the Bears back to contention by getting a couple of really nice prospects to fill vital spots. Offensive lineman Kyle Long helps a unit that has to be on its game to protect deliberate, must-see-it-first quarterback Jay Cutler. On defense, the Bears picked up linebacker Jon Bostic from Florida to replace Brian Urlacher. Mark this down: In five years, people will be talking about how much better Bostic is than Manti Te'o. Michael Vick – Like Rex Ryan, Vick was a winner Thursday when the Eagles drafted Lane Johnson to rebuild the offensive line. Like Ryan, things got even better in the second and fourth rounds. First, Philadelphia drafted tight end Zach Ertz, giving Vick another big-time weapon and a guy the Eagles can pair with Brent Celek for some tasty two-tight end formations. In the fourth round, the Eagles traded up to get Matt Barkley. Sure, Barkley may be no better than a backup, but he's going to be competition for current No. 2 Nick Foles. In other words, the perception that the competition for time was between Vick and Foles just got really blurry. That can only help Vick. New Oakland Raiders CB D.J. Hayden – This is one of the best stories of the draft, as Hayden went from nearly dying after an odd practice injury in November to being cleared for the draft in the past two weeks. Once cleared, teams took a closer look at his tape and he nearly was the No. 1 cornerback taken in the draft (the Raiders would have taken him at No. 3 if they hadn't traded down with Miami to No. 12). Either way, Hayden has gone from one end of the spectrum to the other, the direction being nothing but up. Tennessee Titans RB Chris Johnson – Johnson might legitimately be able to become CJ2K again as the Titans seriously rebuilt their offensive line and helped the passing game. After getting Andy Levitre in free agency, the Titans picked up stud guard Chance Warmack in the first round and center Brian Schwenke in the fourth. The Titans are now almost imposing in the middle. If that wasn't enough, Tennessee got wide receiver Justin Hunter in the second round in case Kenny Britt can't come back from injury. If Britt does, the Titans can put Britt, Hunter and Kendall Wright outside to create all sorts of problems for the secondary and make life a lot easier for Johnson and quarterback Jake Locker. 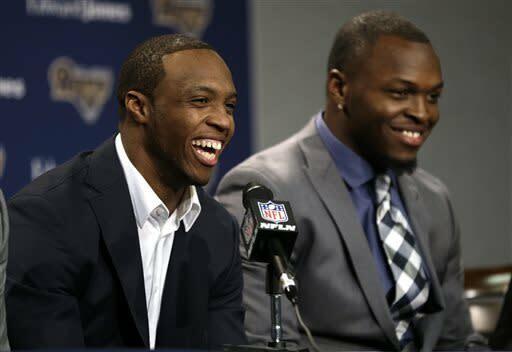 Dallas Cowboys – There are times when you look at what a team does in the draft and say, “What the heck was that?” The Cowboys did just that when they first traded out of a spot to get pretty good defensive help (safety Eric Reid went with the pick the Cowboys gave up) and then passed on Matt Elam. In the process, the Cowboys took a guy (center Travis Frederick) who many teams didn't project to go until Saturday. While the next pick (tight end Gavin Escobar) was solid, the Cowboys then took wide receiver Terrance Williams and safety J.J. Wilcox, a pair of guys who are complete projects. Williams is not particularly fast and produced stats largely because he played in Baylor's pinball offense. As for Wilcox, he's a small-school product (Georgia Southern) with one year of experience. In the third round? Yikes. Kansas Chiefs OT Branden Albert – The long-discussed trade of Albert from Kansas City to Miami never materialized, even though the Dolphins were willing to meet Albert's contract demands. Miami general manager Jeff Ireland indicated that everything was pretty much dead on the deal on Friday, but that doesn't mean the teams won't somehow revisit the idea later. The Dolphins have tried to leverage the fact that Kansas City doesn't need both Albert and draft pick Eric Fisher. The Chiefs are figuring that they eventually will get some interest from teams that didn't fill their left tackle needs in the draft (Detroit, San Diego and Arizona are still in that mix). Look for Albert to eventually move for a second-round pick in 2014. New England Patriots – Yeah, yeah, Bill Belichick is the smartest coach who has ever lived and I am nothing but a bumbling sports writer who should bow to his greatness. … Got any other good ones, Pats fans? Look, I'm one of Belichick's biggest fans in the media and one of the few who has defended many of his moves. At the same time, I'm perplexed by some of the things he does in the draft. From drafting too many guys to moving out of the draft at key moments, Belichick oftentimes is a guy who is too smart for his own good. The Pats traded out of the No. 29 spot even though safety Matt Elam was there and Elam fits the profile (hence, Baltimore took him three spots later). The Pats, who are entering the winter of Tom Brady's glorious career, need guys who can help NOW, not in three years. Sure, the Pats picked up a couple smart-guy receivers in second-rounder Aaron Dobson and Josh Boyce, but they would have gotten Dobson anyway and could have easily gotten Boyce with a lesser trade later. In other words, they bypassed Elam for no great reason. Quarterbacks – This was also mentioned coming off the Thursday night debacle that saw only E.J. Manuel get drafted in the first round, but the situation got a day later for the half-dozen top passing prospects in this draft. The leader of that pack was Matt Barkley, whose weak arm and mediocre athletic ability underwhelmed NFL folks. This was a case of the luster of Southern Cal's reputation finally starting to fade as Barkley didn't go until the fourth round and only got drafted by a team that already has Michael Vick and Nick Foles ahead of him. That's pretty awful. Worse, Barkley is not well-suited to run the hurrying style that coach Chip Kelly prefers. Aside from Barkley, Ryan Nassib didn't go until the fourth round, Mike Glennon went in the third and Smith went in the second. Those were all a round or two below where each of those guys was expected. Eddie Lacy and all running backs – For the first time since 1973 (when the NFL had only 14 teams), a running back didn't go in the first round of the draft. Lacy was expected by many to go in the first round and be the first one taken. He ended up going No. 61 overall and was the fourth back to go despite having a stellar career at Alabama. There are two reasons for that. The first is specific to Lacy; he is beaten up. This is a kid who runs hard and runs with power, but has taken more than his share of hits along the way. He's currently nursing a turf toe injury, but he has had other problems since high school. The second issue is the devaluing of the position. This is a full-on passing league that features so many wide-open sets with three, four and even five receivers that a running back isn't much more than window dressing. 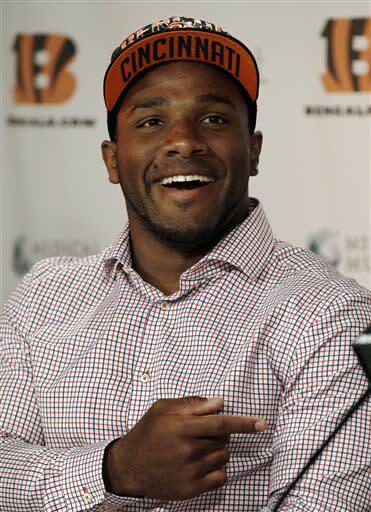 The most telling proof of that is Giovani Bernard, who at 5-foot-10 and all of 205 pounds, was the first back off the board. New York Jets QB Mark Sanchez – Things were already bad enough for Sanchez in New York, where his 52 turnovers the past two years were called out by everybody, including owner Woody Johnson (Johnson's mantra has become, "The quarterback can't fumble"). On Friday, the Jets made no bones about Sanchez's future when they drafted Geno Smith and he was immediately dubbed "Broadway Geno." While Smith has a long way to go, the only hope for Sanchez at this point is that the Jets are willing to swallow the $8.25 million they owe him this year and just let him go. That would be the humane thing. Then again, football is not a humane sport. • Watch: Is Manti Te'o a good fit for the Chargers?